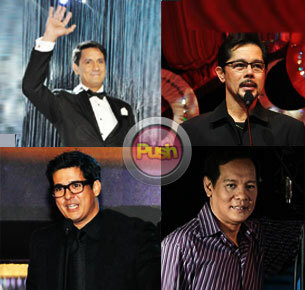 Richard Gomez, Aga Muhlach, Christopher De Leon, Joey Marquez, Jolo Revilla, and Alfred Vargas plan on joining the upcoming elections. After his successful role in the teleserye Walang Hanggan, Richard Gomez will try his luck in the field of politics once again. He lost when he first sought a Senate position in the 2007 elections. Later on, he ran for Congressman in the 2010 elections, but was later disqualified because of his “failure to sufficiently establish the required one-year residency in Ormoc City.” Richard reportedly said that he’s capable to be the next chief executive given his background as presidential adviser on youth and sports development for two years, coupled with his studies on legislation and good governance. It seems that nothing can stop Aga Muhlach’s congressional bid as the petition for the disqualification of his candidacy was dismissed by COMELEC due to lack of merit. The poll body maintained that the actor (whose father is of Spanish origin) is a “natural-born Filipino-under Philippine laws,” adding that he already executed an affidavit renouncing any foreign citizenship and an oath of allegiance to the Republic of The Philippines. This decision cleared up questions about his residency, which keeps him from being removed from the 2013 candidates’ list. Currently a senior member of Sangguniang Panlalawigan in the Second District of Batangas, Christopher de Leon has decided to run as Congressman in the coming May 2013 elections. However, questions about his Filipino-American citizenship poses as a problem due to court ruling that “any dual citizen cannot run for any elective public position in the Philippines unless he or she personally swears to a renunciation of all foreign citizenship at the time of filing the certificate of candidacy.” Christopher owns a 7,000-hectare property in Tingloy, Bauan, Batangas. Currently working as TV host on Showbiz Inside Report, Joey Marquez will try his luck in politics once again in the coming elections. He first served as Vice Mayor of Parañaque from July 1992 to June 1995. Then he won as Mayor for three terms in the same city. However, he both lost his bid for Congress in 2004 and the Mayoralty post in 2010. This time, he is confident that his fellow citizens of Parañaque will support his bid for political office. Last seen in ABS-CBN’s teleserye My Binondo Girl, Jolo Revilla decided to leave the showbiz world and concentrate on his political career instead. Aside from being the incumbent Barangay Captain of Panapaan VII, Bacoor, the 24-year-old has also served as President of Association of Barangay Captains as well as a member of Sangguniang Panlalawigan in Cavite. He previously stated in an interview that he’s not worried about the issue of political dynasty given his family’s dedicated service and contribution to their province. An incumbent Councilor in the Second District of Quezon City, Alfred Vargas was last seen in the teleserye Lorenzo’s Time. He has decided to take a break from showbiz, however, in favor of public service. Alfred added that he learned a lot during his first term as Councilor through the help of Speaker of The House Sonny Belmonte, Mayor Herbert Bautista, and Vice Mayor Josefina Belmonte. The 31 year-old is an AB Management Economics graduate from Ateneo De Manila University. Other TV personalities running for political office are Annabelle Rama (Representative, North District, Cebu), Jinkee Pacquiao (Vice Governor, Saranggani Province), Rez Cortez (Congressman, Fifth District, Camarines Sur), Mary Grace Llamanzares-Poe (Senator), Sol Aragones (Representative, 3rd District of Laguna), Lino Cayetano (Congressman, Second District of Taguig), and Lou Veloso (Vice-Mayor, Manila). Celebrity re-electionists include Vilma Santos (Governor, Batangas), Manny Pacquiao (Congressman, Saranggani District), ER Ejercito (Governor, Laguna), Herbert Bautista (Mayor, Quezon City), Lucy Torres-Gomez (Representative, Fourth District, Leyte), Isko Moreno (Vice-Mayor, Manila), Alma Moreno (Councilor, Parañaque City), Lani Mercado (Representative, Second District, Cavite), Daniel Fernando (Vice Governor, Bulacan), and Roderick Paulate (Councilor, Second District, Quezon City).